9 - 12 grade online test. "Psychology Subjects Test" is a free online knowledge level application, used for valuation. 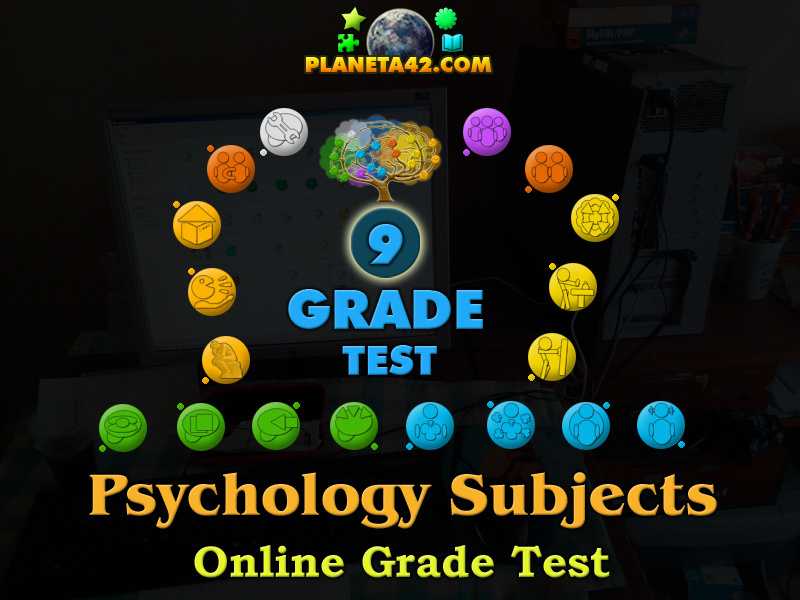 This test include questions about some basic concepts, notions and subjects studied by psychology science in 9 - 12 grade. The Psychology Knowledge Board include integrated evaluation system. The test is part of the Interactive Interactive Mind Studies educational tools. It is cumulative with the Psychology Tree game. 9 - 12 grade psychology classes for evaluation or theoretical lessons. How to play Psychology Subjects Test. Know the basis of Psychology. Download version(bottom of the page) include an executable file for Windows OS with local levels only. - The study of general problems such as existence, knowledge and reason. - The study of life and organisms. - The study of space and universe. - Bringing justice in unfair situations. - Defending and recommending concepts of right and wrong conduct. - Mental action or process of acquiring knowledge. - The ability of the mind by which information is encoded. - The desire for good emotions. - The art of speach and persuasion. 4. What the Mind include? - Consciousness, perception, thinking, judgement, memory. - Strength, power, muscle, speed. - Water, air, earth, fire. - The characteristic of a super computer. - The faculty by which information is encoded, stored, and retrieved. - The ability for perception and judgement. - A set of individual differences. - The mental action of acquiring knowledge and understanding. - Acquaintance between two or more people. - Intense mental activity with a high degree of pleasure or displeasure. - A strong, deep, or close association. - A theoretical construct used to explain behaviour. - A theoretical construct used to explain morality. - The range of individuals actions. - Desire, love, feelings, pleasure. - Logic, understanding, planning, creativity. 12. Where Relationships are important? - When leaders enspire folowers. - When physical features are considered aesthetically pleasing or beautiful. - When people have Relationships. - The ability to understand. - The ability to adapt. - Identification and interpretation of sensory information. - A cognitive process to decide and commit a particular course of action. - The ability to move objects. - Storing and using sensory information. 18. For what Psychotherapy is not used? - To change and overcome personal problems. Labels: Psychology Tests , Test Games , Flash Games , Knowledge Games , Education Games , Free Online Tests.